Home Binibining Pilipinas Search Is On for Binibining Pilipinas 2018! 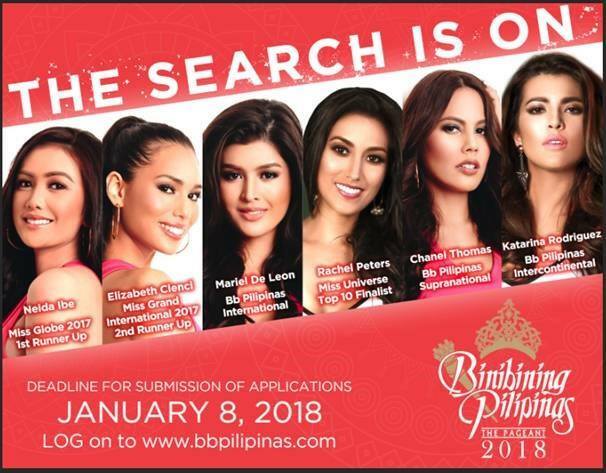 Search Is On for Binibining Pilipinas 2018! Calling all beautiful and qualified Filipinas all over the world to submit your applications and be the next Binibining Pilipinas 2018 queens! Binibining Pilipinas Charities, Inc. (BPCI) official Facebook page announced that the search is on for the 55th edition of Binibining Pilipinas candidates. Deadline for submission of application is on January 8, 2018. Applications are open to interested single ladies ages 17 to 26 years old, with Filipino citizenship, at least a high school graduate, and of good moral character. Aside from the application form and one close up and full body shot, other requirements include: birth certificate and Philippine passport, college or high school diploma, medical certificate, certificate of good moral character, and parents' consent for applicants below 18 years old. You may download the application form on www.bbpilipinas.com or drop by BPCI Office located at Uniprom Inc., Smart Araneta Coliseum, Quezon City.